Sticky Mouse-ear is very like Common Mouse-ear in many ways but, to me, the most notable difference is that the flowers of a Sticky Mouse-ear are in compact flower-heads whereas those of the Common Mouse-ear are in loose clusters. Also Sticky Mouse-ear is a paler, yellow-green in colour whereas Common Mouse-ear is a darker green. 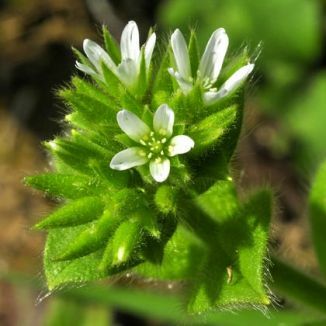 The white flowers (10-15 mm) have five cleft petals, very short flower-stalks and five sepals which are extremely hairy right up to the tip. 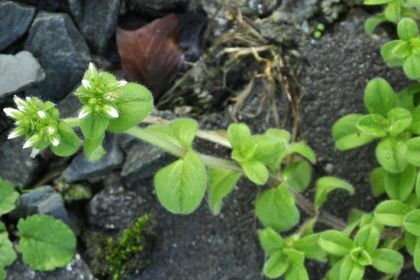 The pointed broadly ovate, yellow-green leaves are covered with sticky hairs. This is an annual plant (occasionally over-wintering), growing to about 40 cm, which is found from April to September on arable ground, sand-dunes, walls and roadsides. A native plant, it belongs to the Caryophyllaceae family. I first recorded and photographed this plant in Saltmills, Co Wexford in 2009 and the identification was kindly confirmed for me by Paul Green, BSBI Vice-county recorder for Wexford.